Hamline University was established in Red Wing in 1854 and was the first school of higher learning in the state. At this site the Minnesota Conference was officially organized in 1856. Shuttered during the Civil War, Hamline University reestablished itself in 1880 in St. Paul at Snelling and Hewitt Avenues. A large bronze plaque on First UMC, Red Wing tells the story. The original site of Hamline University became a Minnesota Conference Historic Site in 1969. This site is registered with the General Commission on Archives and History #477. This unique figure in Minnesota Methodism was born in Sweden in 1795 and, in his teens, immigrated to America through Hudson Bay, finally settling along the Red River of the North. He married Marguerite Bonga a Chippewa woman, and was adopted into her family and Fort Snelling became their home. Here he fell under the preaching of David King and became the first Methodist convert in Minnesota and the first local pastor. They were members of the Kaposia Church. For twenty years he served as a missionary to Chippewa Indians and in lumber camps. He died in 1859 and was buried in the family cemetery north of Afton, Minnesota. The site is on a hilltop to the left of the house in which he and his wife, Margaret, and three daughters lived. A granite stone marks the grave. Jacob Fahlstrom’s Grave was designated a Minnesota Conference Historic Site in 1965. This site has been registered with the General Commission on Archives and History #475. In 1922 the Evangelical Association and United Evangelical Church agreed, after 30 years of conversations, to seek unity. A sign of that union was the purchase of a seventeen-acre camp site on Lake Koronis near Paynesville. A dormitory and tabernacle were built, financed largely by the sale of house lots to laity and clergy. Summer Assembly, Red Rock Camp, and a variety of camping experiences continue to serve churches across the Annual Conference. Lake Koronis celebrated its 95th season in 2016. Lake Koronis was designated a Minnesota Conference Historic Site in 1998. This site has been registered with the General Commission on Archives and History #517. The St. Croix Mission of the Wisconsin Conference officially organized at Market Street on December 30, 1848, the first Protestant church in Minnesota. The gift of ten lots on Market Street by businessman Henry Rice enabled the 1849 construction of a small brick church for $2,834.04. The original eight members soon grew to 47, selecting the name “Market Street Methodist Episcopal Church.” Located across from Rice Park, the site is now home to the St. Paul Hotel. 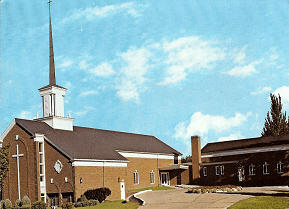 On September 27, 1987 a plaque was dedicated at the original church site. The plaque can be viewed on the parking ramp wall just south of the St. Paul Hotel. This site has been registered with the General Commission on Archives and History #472. Evangelical Church congregation in Dakota County. In 1855, two Canadian families, the Gackstetters and the Laschingers, acquired farm land in the county and promptly requested ministerial leadership. The 1856 Wisconsin Conference of the Evangelical Church assigned Andrew Tarnutzer to the Minnesota Territory. By March of 1857, he had organized class meetings in both Inver Grove and Dayton’s Bluff. A small framed building (two windows, one door, several benches, pump organ, two wood burning stoves) sufficed until 1874 when the current church building (20' x 32') was built. The first camp meeting was held between July 1 and 6, 1857, involving seven tents, two covered wagons, and nine conversions. Founders’ Day is observed yearly in the month of June. Old Salem Shrine became a Minnesota Conference Historic Site in 1968. This site has been registered with the General Commission on Archives and History #78. Ottawa Church was originally named “Minnewashta” (good water), and in 1856 renamed Ottawa Methodist Episcopal Church in honor of the Algonquin Indian tribe. Built in 1859 of native pink stone, the church is one of the three oldest German Methodist buildings in Minnesota. Closed in 1952, the building, while no longer a place of worship, remains the focus of Ottawa pride. Ottawa became a Minnesota Conference Historic Site in 1968. The building is preserved as an historical site in memory of Christian pioneers by the LeSueur County Historical Society. Restored and refurbished, the building was rededicated on Sunday, September 22, 1968, and now houses artifacts and memorabilia. This site has been registered with the General Commission on Archives and History #473. A brief history of the church written in 1976 states that the church was organized in 1855 and meetings were held in homes until a school was built. In 1876 the church building was planned and built at the cost of $1540. Thirty-nine ministers have served this congregation. In 1932 the members transferred to Caledonia and the church has been preserved with one or more services held there annually. Portland Prairie is significant in its unique architecture and status on the National Register of Historic Places. Portland Prairie was designated a Minnesota Conference Historic Site in 2008. This site has been registered with the General Commission on Archives and History #541. In 1837 a mission was established at Dakota Chief Little Crow’s village. When trouble erupted with Chief Little Crow in 1839, the pastor in charge moved part of the mission to the east side of the Mississippi River near the famous Red Rock of the Sioux, a sacred granite boulder painted with red stripes and revered for generations by the Indians. Pastor Benjamin Kavanaugh built a two-story log cabin. The first floor became a school for children, the upper floor the pastor’s home. Both the Red Rock and the restored cabin, the oldest Methodist building in Minnesota, can be seen on the grounds of the Newport United Methodist Church. Red Rock Camp Meetings were held near this site for many years. The Red Rock and Missionary Log Cabin were designated a Minnesota Conference Historic Site in 1971. This site has been registered with the General Commission on Archives and History #474. Organized in 1859, this church is the oldest United Methodist church in continuous use in the Minnesota Conference. Constructed of white pine, the eastern style church reminded the early New England settlers of “back home.” It was completed in 1861 at a cost of $2,500 on deeded land, with donated materials and labor. To defray costs, pews were sold to parishioners for $65 each. The church was dedicated on January 1, 1862. Five years later the cupola and belfry were added, along with front columns. Taylors Falls UMC was designated a Minnesota Conference Historic Site in 1970. This site was registered with the General Commission on Archives and History #476. The First Finnish Methodist Church of Moose Lake, MN was founded in 1891 making it the First Finnish Methodist Church in North America. The founding minister, John H. Michaelson, was converted to Methodism in the year 1887. Having settled in Moose Lake, Minnesota and having previously been chosen as a local preacher Michaelson gathered a group of people for services of worship. In 1891 they formed a Methodist congregation. In 1892 a log church was built near Michaelson’s farm on donated land. Over the course of several years Finnish speaking clergy were appointed. The building was updated and dedicated in 1904. In the Great Fire of 1918 the church and surrounding property were completely burned. The cemetery remains. This site was designated a Minnesota Conference Historic Site in 2011 and a monument was erected at the site in 2013. This site has been registered with the General Commission on Archives and History #485. The site is located at Highway 27 and township road 230 in Carlton County, about 7 miles west of Moose Lake. The First Methodist Mission in Minnesota was established in 1837 at Chief Little Crow’s Sioux Village of Kaposia, now South Saint Paul. Sent by the Illinois Conference, Rev. Alfred Brunson, superintendent, Rev. David King, missionary and teacher, John Holton, farmer, and newly freed slave James Thompson, interpreter, negotiated its beginning. The original site of the village and the three mission buildings have long since been removed. The village was located between the bluffs and the Mississippi River. Behind the bluffs a mission farm of 150 acres was established. A plaque commemorating the mission can be seen at the Dakota County Historical Society. This site was designated a Minnesota Conference Historic Site in 1962. This site was registered with the General Commission on Archives and History #470. The old stone church at Lenora, Fillmore County, is one of the few stone churches built by pioneer Methodists in Minnesota. The Reverend John L. Dyer, a frontier evangelist, was appointed in 1855 to the Richland Circuit in Fillmore County. He donated 40 acres of his “claim” for the town site of Lenora. The sale of lots enabled construction to begin on the stone church in 1856. The 1857 financial panic stopped the project. In 1865 the same stone was used to build the present structure. A plaque commemorates John Dyer and all pioneer Methodist preachers in southern Minnesota. Active and vital until about 1925, a declining Lenora area population dictated its closing. This site was designated a Minnesota Conference Historic Site in 1962. This site has been registered with the General Commission on Archives and History #471. The Olivet congregation has the distinction of being the first Evangelical United Brethren Church organized in Minnesota after the 1946 Uniting Conference of the Evangelical Association and the United Brethren in Christ. The Minnesota Conference of the Evangelical United Brethren took action in the spring of 1947 to start a new church in the immediate area where the present church is located. A house was purchased and used for Sunday School and worship. The congregation broke ground for a church building in May 1950. In 1959 the Minneapolis Hope EUB merged with Olivet. In 1968, after the union of the Evangelical United Brethren Church with the Methodist Church, this church became Olivet UMC, Robbinsdale. The church continues its mission. This church was designated a Minnesota Conference Historic Site in 2010. Situated at Marquette and Grant Streets, this magnificent church was dedicated on March 2, 1891, the precise day of the 100th anniversary of John Wesley’s death. The red stoned Wesley Church cost its membership $150,000. An adjoining Wesley Temple building completed in 1929 was removed in 1987. Called the “Mother Church of Minneapolis”, Wesley birthed many of the UMC churches in Minneapolis today. The church is listed on the National Register of Historic Places. Wesley Church was designated a Minnesota Conference Historic Site in 1983. This site was registered with the General Commission on Archives and History #501. Located across the street from Hamline University in St. Paul, this gothic structure features original art designed specifically for the building and implemented by local experts, including Andreas Ruud Larsen and Carlo Brioschi. Its stained glass windows, highly ornamented, hand-carved woodwork and stone-carving are awe-inspiring. Many significant events have occurred here, including the 1958 ordination of the first woman in Minnesota to receive full clergy rights. Because of its art and architecture, it was added to the National Register of Historic Places in December 2011. The congregation has operated a dining hall at the State Fair since 1897, the longest operating concession on the fairgrounds. This is an active congregation. The Hamline Methodist Episcopal Church was designated a Minnesota Conference Historic Site in 2014. It was registered with the General Commission on Archives and History as Site #505.